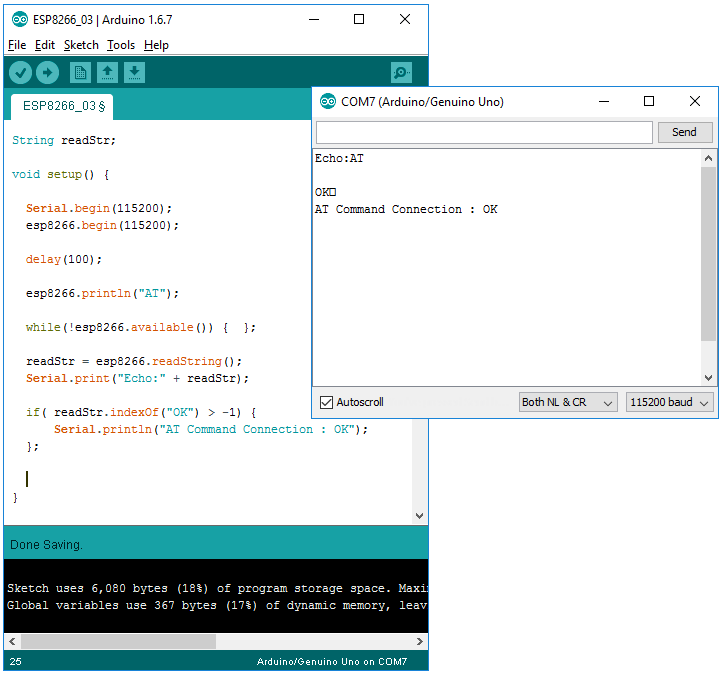 NOTE : This tutorial can be a good example to show you how to utilize the serial commuincation on Arduino board. This note will be very long and continuously revised and added. Followings are the list of topics covered as of now. Step 5. Set the device mode to make it function as both 'Client and AP (Mode 3)'. Basic function and pin mapping for the most of ESP8266 module are same (or similar), but the detailed behavior may be a little different depending on the firmware version or manufacturer of the module. So my recommendation is to search things about the modules and pick something from the manufacturer that provide the detailed documentation. The one that I purchased is shown below (Actually this was the only one that I could get from a local electronics shop in my area). Followings are the descriptions on the pins out of the module. I think these pin mapping would be same for all the module that looks like this. The function of each pins are as follows. One thing to be VERY CAREFUL is that you have to put 3.3V (not 5V) in VCC. You would burn the chips on the board if you apply higher voltage. 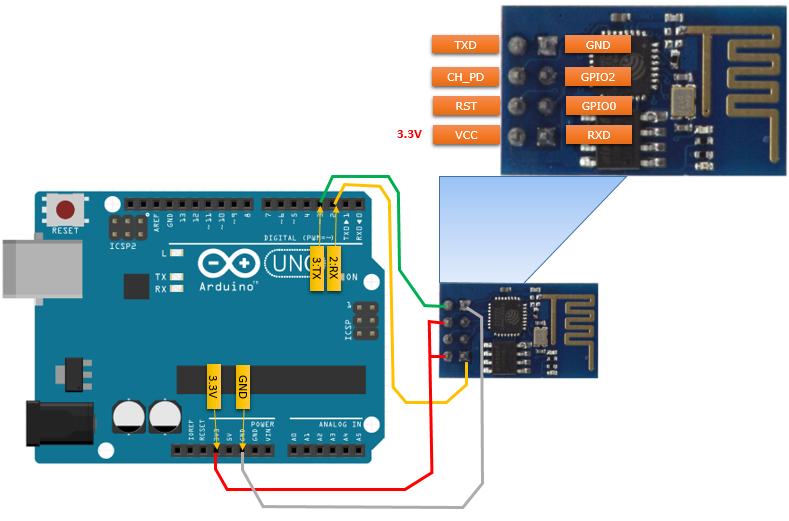 The connection between the esp8266 module and Arduino board is as follows. 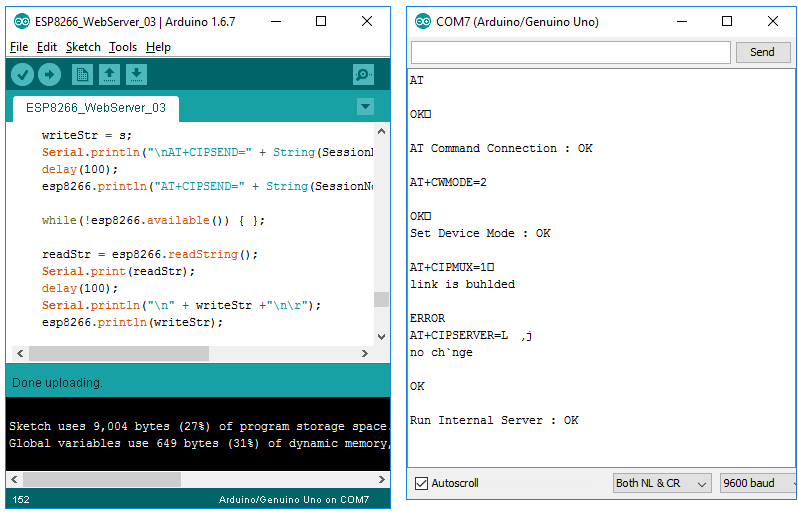 As you may guess from this connection, the communication between Arduino board and the esp8266 module is done via UART port. 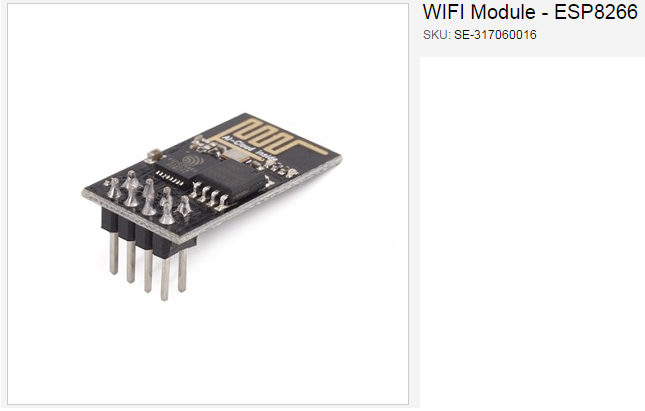 It implies that ESP8266 module is a kind of a translator converting WiFi protocol to UART (Serial Port) protocol and vice versa. I want to point out a couple of important points that you need to pay attention to. Note 1 : VCC of the esp8266 is connected to 3.3 V of Arduino. Do not ever connect 5V output of Arduino directly to the VCC of the esp8266 module. It will burn the chip on the module. If you want to connect 5V output to VCC, you need to build a small voltage divider circuit using resistors so that only 3.3V is supplied to VCC. Note 3 : In this tutorial, I used 3.3V output of Arduino board to simplify the connections. If you use the connection and a small breadboard, you don't need any soldering and you don't need any extra component like resistors. However the problem of 3.3V output of Arduino board is that it is not able to supply large current. It can supply just around 50 mA max. However, as you see in electrical specification (), this amount of current may not be sufficient to some of the mode of operation of esp8266. So after you get familiar with manipulating the module and get confident, I would recommend you to use external power supply to VCC or "Arduino 5 V output + voltage divider circuit". Note 4: As you see below, I haven't used any other extra component (e.g, resistors, external power source etc) to make the connection as simple as possible and just for simple testing. However, if you want more stable working or long term operation, I would suggest you to think of connecting the module as described in ESP8266 Setup Tutorial using Arduino. Please read the full text of this linked page and understand why the writer is using the resiters and external power source. I think it is pretty good tip. 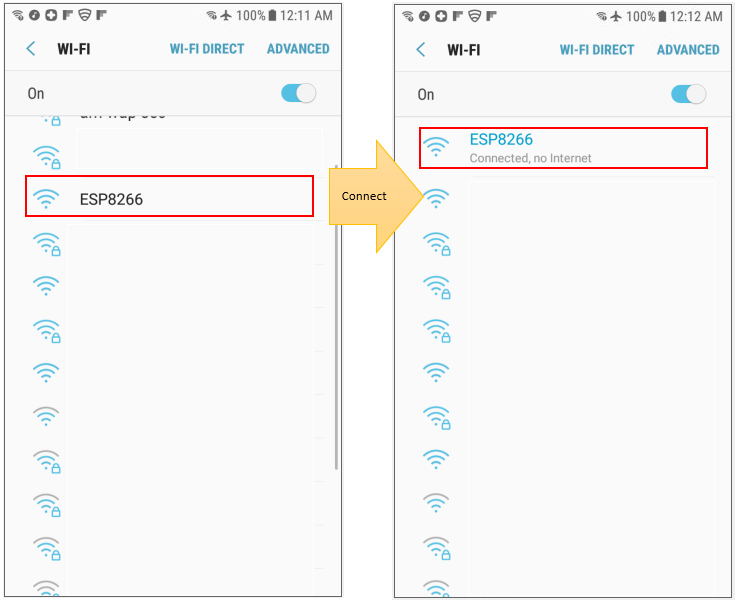 With all the wiring done properly, now it is time to connect to the esp8266 and configure the chipset, get it connected to your WiFi Network. Procedures described here is based on the assumption that you are connecting the module for the first time, you may skip some of the steps when you try next time. This is not a mandatory step, but I would recommend this at least for the initial configuration process just to make it sure that any existing program is interfering the initial configuration process. Creat a new sketch with no code in it (only the empty setup() and loop() is there) and compile / upload it to the board. iii) Type in 'AT' and press Enter. If you get 'OK', it means the communication between ESP8266 UART pin and Arduino UART port is working. Now reset the WiFi module. You don't need to do this every time. Just doing it for the first time or when you reset the device and configure everything from scratch. Send AT+RST. If you see 'ready' at the end of the result, it indicates the reset is complete. The detailed output before 'ready' may vary depending on the module and firmware version that you are using. 5. Set the device mode to make it function as both 'Client and AP (Mode 3)'. Now set the mode of the WiFi module to be 3 as shown below. 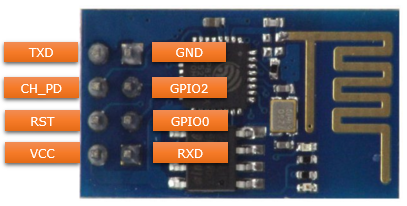 Note : There are three different modes for ESP8266 as follows. Now search WiFi Accesspoints available around the module. Following is an example of search result. You can figure out many details of the each Access Point that are found by interpreting the result of AT+CWLAP as shown below. Now you can join to any one of the APs that are found in previous step using AT+CWJAP command as shown below. 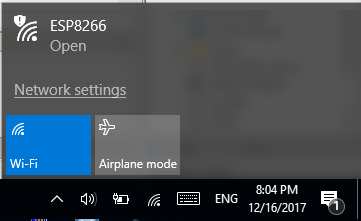 If the connection to the specified AP (SSID) is done properly, you would get the IP address assigned to the module when you send the command AT+CIFSR. +CIFSR:STAIP,"192.168.0.22" // Make it sure that you got IP address assigned here. 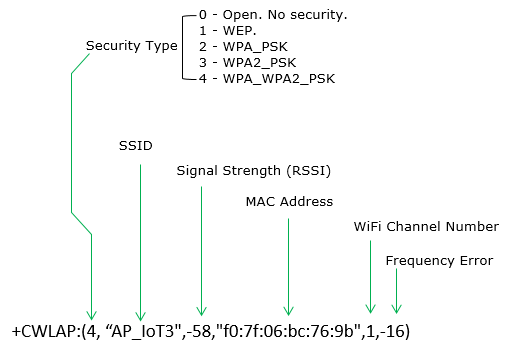 If you went through all the procedure and got proper response for those steps, the module is properly configured and connected to your WiFi network at IP level. NOTE : AT+CWSAP command format and meaning of each parameter is as follows. If the command is executed successfully, check if the module can be found as an AP(Access Point) with your PC. 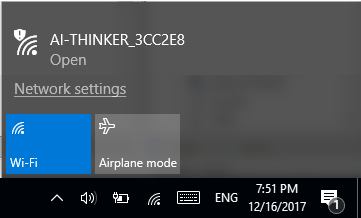 If everything is working fine, you would see the SSID from your PC or mobile phone. Then try Connect and see if it get connected as shown below. You can do same checkup with a mobile phone as shown below. Now let's check if the module works at higher layer (higher layer than IP, e.g TCP layer). In this tutorial, we will configure the module as a TCP client and try to get access to a web server. 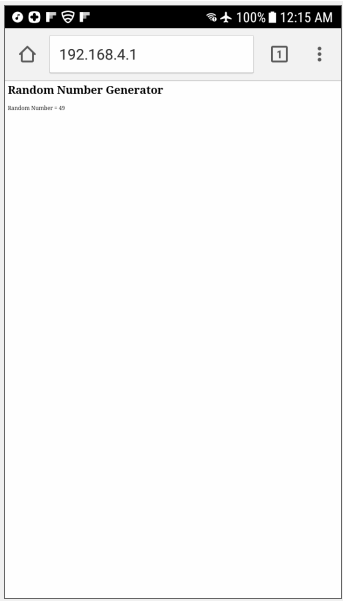 (You don't need to have your own web server for this test because we will try to connect to a public server). 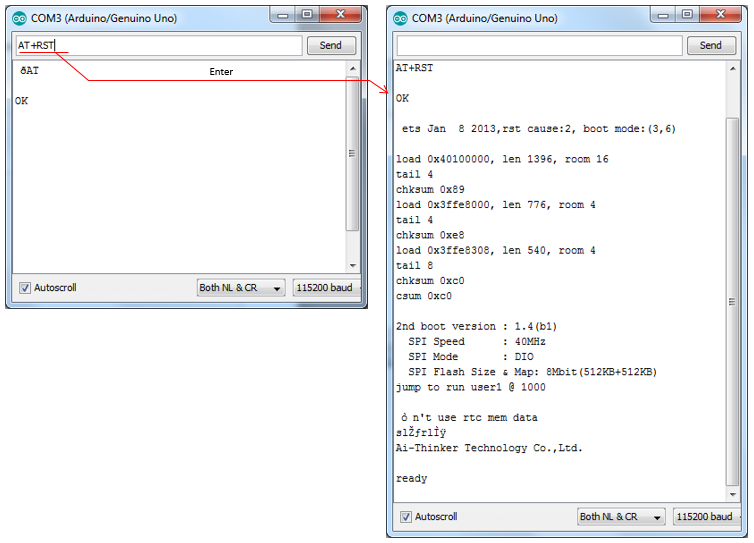 Enable the IP multiplexing capability of the module by using AT+CIPMUX command as shown below. Note : This command would take a some time (several seconds) to establish the TCP connection to the server and give the return as shown above. In some case, you may get 'DNS fail' error. I am not sure about the exact cause of this error.. my guess is that it is because the module failed to get DNS response for the url. Probably because of too low network speed. But the exact cause is not known. Just a couple of more tries and see if you get connected. Now send following command. This indicate 'give me the prompt to send 18 bytes of data'. // that the server can understand. 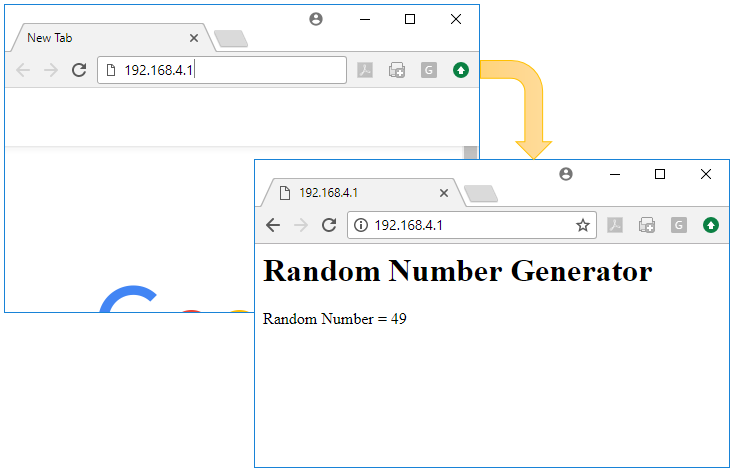 Since the server that is connected in this tutorial is a web server, you can send a command as follows to retrieve a contents. // contents from the server. The example shown above is to configure the module manually by typing an AT command. 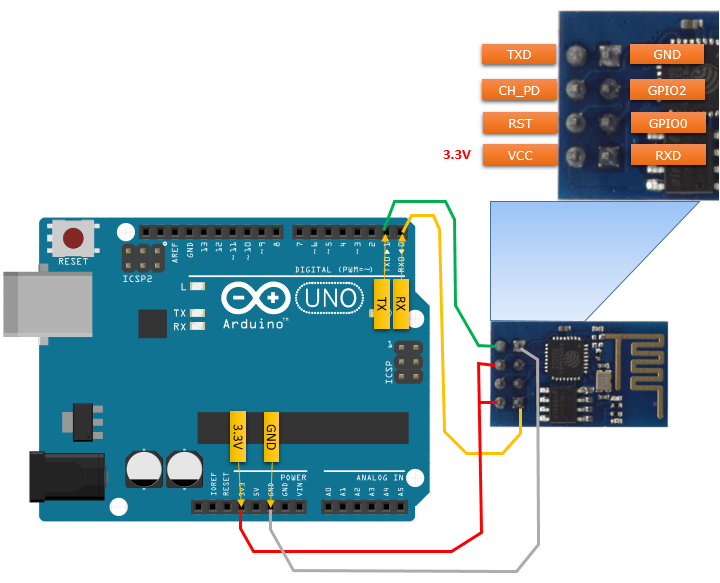 However, in real application it would be more likely to configure the module automatically by Arduino program. ESP8622 is not a sample module like a sensor or motor. It is a kind of a system on its own (It is a kind of SoC (System On Chip)). In this example, I will show you an application that can show you a power of ESP8266 module. In addition to WiFi chip, it has its own processor on it supporting various type of functionality. In this example, I will configure ESP8266 to work as an AP (Access Point) and run a TCP server. When user get access to the TCP server via a browser, the module will send response in the form of html format. 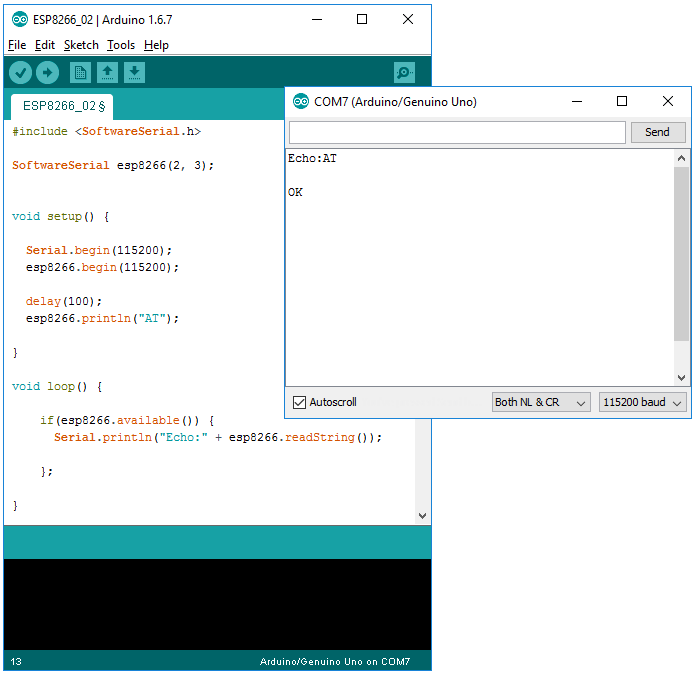 The connection between Arduino and ESP8266 is shown as below. In this example as well, I will use pin 2,3 as a software serial port that communicate with ESP8266. Before you run any of the examples in this section, make it sure that you performed the procedure described in following section. NOTE : Followings are the description of the some of important parts (I think you would understand most of the other parts without any special explanation). SessionID : Actually you would need to figure out Session ID by programming (e.g, by parsing the result of +IPD command), but for simplicity I hardcoded the session id here. If you run the module as AP only mode ("AT+CWMODE=2"), the session ID would be set as 0, however it may not always be set as 0.